Get updates: Sign me up! Dust off your glam frock, polish up your trusty bike and say “Hello Spring” with a Frockilicious festival of cycling and style! In tandem with Ponsonby market day, on Saturday September 12th 2009, this frocktastic event will frock off at 10am at Western Park. Join us in frolicking frockaliciously on our bicyles! 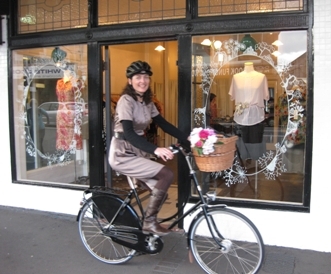 Try out the frock-friendly Velorbis bicycles from The Urban Bicycles Co.
Be in to win PRIZES from WIDDESS for Best dressed, most Frockilicious helmet and bike decoration! At 1pm glamorous frocked up lady cyclists and stylish supporting gents and families will parade along Ponsonby Road from Western Park to Three Lamps and beyond! The boys have Mo-vember and good luck to ‘em in this worthy cause. But, in pursuit of equality and good clean fun, we’re claiming Frock-tober. Saddle up ladies ’cause soon we ride! The Auckland chapter of Frocks on Bikes are plotting some Frocking … so keep your chain oiled and your tyres pumped! Watch this space for details of the 350.org’s climate action event. Start shopping for your outfits now ladies – this will be one of the best Frock-popping events of the year!